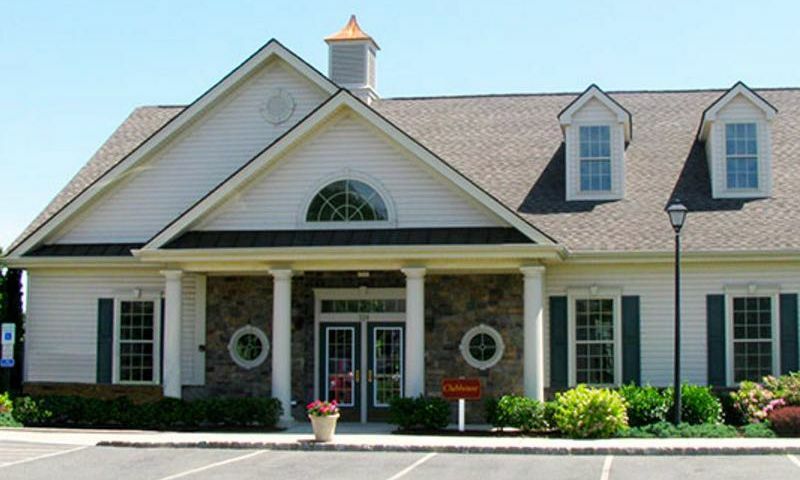 Horizons at Delaware Crossing is a 55+ community located in Lopatcong, New Jersey. This beautiful active adult neighborhood contains 158 attached homes available as new construction or on a resale basis. With a charming clubhouse as its central meeting place, Horizons at Delaware Crossing is perfect for making new friends and exploring hobbies and interests. Residents love coming home to low-maintenance homes in a small, friendly community of like-minded neighbors in Northern New Jersey. At the center of this 55+ neighborhood is the well-appointed clubhouse. Go for a workout in the exercise room before relaxing in the indoor spa or steam room. Attend neighborhood gatherings in the community or conference room, or join a game with friends in the card or billiards room. Horizons at Delaware Crossing also has a catering kitchen and serving bar for hosting the perfect community get together. The terrific amenities continue outdoors with a pool and patio. Residents regularly gather for games in the horseshoe pits or the tennis, bocce ball, or shuffleboard courts. Horizons at Delaware Crossing also boasts walking and biking trails that wind throughout the scenic community and a gazebo is perfectly situated for enjoying a quiet evening outdoors. Horizons at Delaware Crossing began development in 2006 and will contain 158 attached homes upon completion. These homes range in size from 1,738 to 3,030 square feet and offer one or two bedrooms, two or two-and-a-half bathrooms, and an attached two-car garage. Homeowners love that these residences offer high ceilings, granite countertops, stainless steel appliances, and hardwood floors. The monthly homeowners association fee takes care of tedious exterior chores like snow removal, lawn care, and trash pick-up. Living within Horizons at Delaware Crossing means enjoying socializing with neighbors and friends. There are several ways to stay in shape with bocce ball, shuffleboard, and tennis. Homeowners also gather for bowling night, bingo, Mah Jongg, and poker. Meeting newcomers is easy with holiday and Super Bowl parties, as well as Sunday brunch. Horizons at Delaware Crossing ensures that residents' social calendars will be full year-round. Horizons at Delaware Crossing is located in Lopatcong, New Jersey. It is conveniently located across the street from the Lopatcong Center hospital. Around the corner on Memorial Parkway are grocery and department stores, restaurants, banks, and gas stations. The Lehigh Valley International Airport is just over 15 miles away, while for local travel Interstate 78 is just a few minutes from the community entrance. Horizons at Delaware Crossing also pleases golf lovers thanks to its proximity to Architects Golf Club and Riverview Country Club. Outdoor recreation is also easy with Marble Hill Natural Area and the Merrill Creek Reservoir nearby. For big-city entertainment, Horizons at Delaware Crossing is just a short drive from Allentown and Bethlehem, while New York City and Philadelphia also make terrific day-trip destinations. For prime active adult living in Warren County, NJ, look no further than Horizons at Delaware Crossing. There are plenty of activities available in Horizons at Delaware Crossing. Here is a sample of some of the clubs, activities and classes offered here. Horizons at Delaware Crossing began development in 2006 and will contain 158 attached homes upon completion. These homes range in size from 1,738 to 3,030 square feet and offer one or two bedrooms, two or two-and-a-half bathrooms, and an attached two-car garage. Homeowners love that these residences offer high ceilings, granite countertops, stainless steel appliances, and hardwood floors. I moved into Delaware Crossing almost 2 years ago. My only regret is I should have done so sooner! The community is extremely well taken care of and kept in pristine condition. Not only each individual property, but the common grounds and all the amenities as well. It's also extremely convenient to shopping and my doctors. I've made quite a few good friends as there's a very active social environment too. I am extremely happy with this community. 55places.com is not affiliated with the developer(s) or homeowners association of Horizons at Delaware Crossing. The information you submit is distributed to a 55places.com Partner Agent, who is a licensed real estate agent. The information regarding Horizons at Delaware Crossing has not been verified or approved by the developer or homeowners association. Please verify all information prior to purchasing. 55places.com is not responsible for any errors regarding the information displayed on this website.